신륵사에 세워져 있는 탑으로, 2단의 기단(基壇) 위에 3층의 탑신(塔身)을 올린 모습이다. 기단은 각 면의 모서리와 가운데에 기둥 모양을 하나씩 본떠 새겼고, 탑신에서도 역시 몸돌의 모서리마다 기둥 모양의 조각을 두었다. 지붕돌은 밑면의 받침수가 층마다 4단이며, 빗물을 받는 낙수면은 경사를 약하게 두었고, 네 귀퉁이에서 약간씩 치켜 올려진 상태이다. 꼭대기에는 머리장식으로 노반, 복발, 앙화, 보륜, 보개(寶蓋:지붕모양의 장식) 등이 올려져 있으며, 머리장식부의 무게중심을 지탱하기 위한 찰주가 뾰족하게 꽂혀 있다. 통일신라의 석탑양식을 잘 계승하고 있는 고려 전기의 탑으로, 특히 이처럼 머리장식이 잘 남아있는 예는 드문 편이며, 각 부재를 만든 솜씨도 세련되어 보인다. 1981년 탑을 해체하여 복원할 때 기단 내부에서 흙으로 빚은 소형 탑 108개와 사리함 조각이 발견되었다. 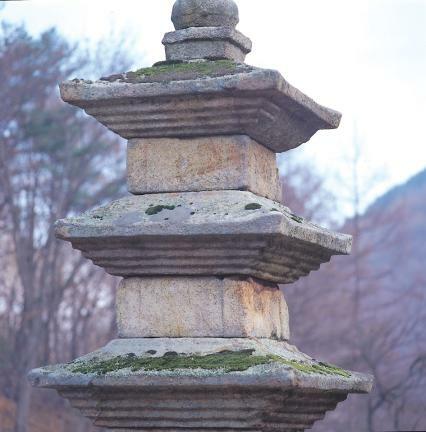 This stone pagoda stands on a two-tiered platform that displays column-shaped inscriptions on the four corners and the center of each side. Each corner of the body also shows column-shaped inscriptions. Each roof stone, which is gently sloped, has a four-tiered bottom. The edges of the roof stones are held up slightly. The stupa finial is composed of bokbal (overturned bowl), lotus flower-shaped ornaments, magic bead placed on the support, and canopy. 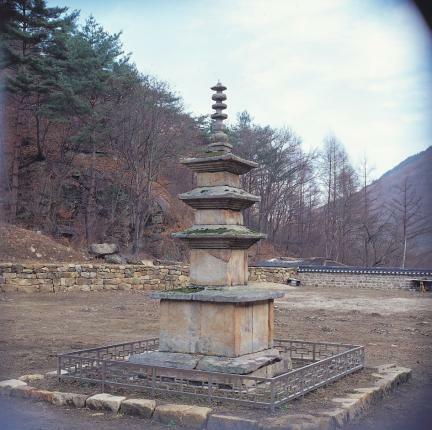 As a pagoda built in the early Goryeo Period (918-1392), it follows the style of the Unified Silla Period (676-935). 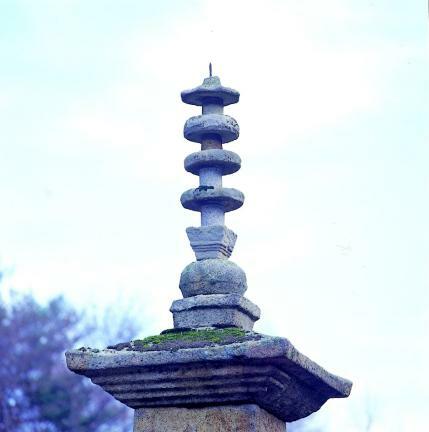 This is one of the few remaining stone pagodas that have kept the stupa finial in good condition. Each part shows refined workmanship. 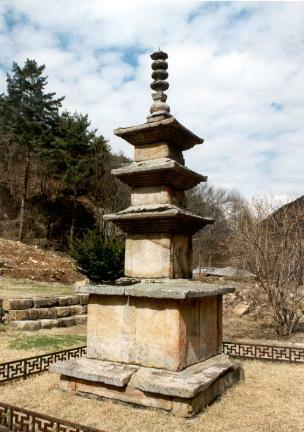 When the pagoda was dismantled for repair in 1981, sarira reliquary pieces and 108 miniature pagodas were found from the inside of the platform.